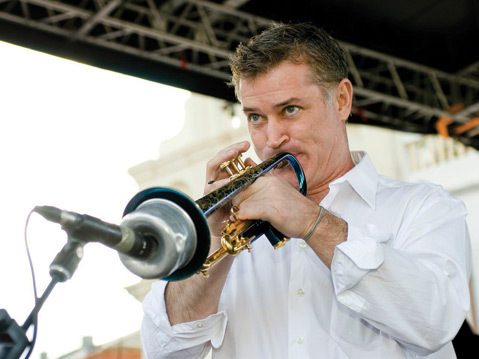 Jazz trumpeter Nate Birkey returns to the 805 this week in honor of his latest recorded offering. Birkey first called Santa Barbara his home when he began his undergraduate studies at UCSB in 1998. After graduation, though, he made the move to New York City to further his musical pursuits and opportunities. Birkey’s new album, titled Just A Closer Walk, features a tasty fusion of gospel tunes and jazz. At first listen, one may mistake the collection for a standard jazz album. But rather, Birkey takes traditional gospel songs and jazzes them up, priming them for intricate instrumental improvisation. When asked about what song stands out most to him among the lot, Birkey states that is difficult to choose because most of the repertoire has deep personal meaning. It turns out Birkey grew up in a religious family singing hymns at his church, and he chose the favorite hymns of various family members as a dedication to them and to thank them for their support of his musical pursuits. The connection between spirituality and music has remained a constant throughout his life, he explains. Although Birkey says there’s no specific message in mind with the album, he does concede that there’s a definite spiritual vibe to the music. “Music is very spiritual for me. Music is a universal thing that touches souls,” he says. Jazz often offers a unique creative expression of a player’s character, a sound that gives us a sense of who they are as a person. Listening to Just A Closer Walk illustrates both Birkey’s musical maturity and his deeply engrained artistic sensibilities. The St. Michael & All Angels Church in Isla Vista was the venue of choice when it came time to record the album. Birkey says that he was aiming for a more organic sound, which he attained by placing a single microphone in the middle of the room to capture the “holistic quality” of the band. The use of a single microphone does not allow for overdubs, so what was captured was spontaneous and improvisational, showcasing each musician’s abilities. These abilities will be showcased throughout this weekend, too, as Birkey plays the Beer Garden at De la Guerra Plaza on Thursday, July 31, with Spencer the Gardner. He and Spencer also team up at the Fiesta Main Stage in De la Guerra Plaza on Saturday, August 2, at 9 p.m. For show info and more about the album, visit natebirkey.com.